Currently, we plan the first dedicated multidisciplinary research cruise to increase our understanding of the significance and role of the air-sea interface (sea surface microlayer, SML) as the boundary layer controlling atmosphere-ocean interactions. The overall objective of this proposal is to gain a detailed and mechanistic understanding of the link between interfacial processes at the sea surface and marine biogeochemical cycles, air-sea interactions and climate. The SML, the interfacial boundary layer between the ocean and atmosphere (typically 40-100 µm thick), has been widely ignored by past and current research efforts, although influence of the SML in air-sea interaction has been known for several decades. Through a holistic approach that will be executed by an international multidisciplinary team (Germany, UK and USA), this study will have widespread and significant impact on the science of marine biogeochemistry and climate related processes at a global scale. Therefore, we conduct the first cruise fully dedicated to the SML that links various multidisciplinary aspects together, such as atmospheric deposition, aerosol chemistry, gas and heat exchange, sea surfaces as microbiological habitat and new technologies for in situ sensing. 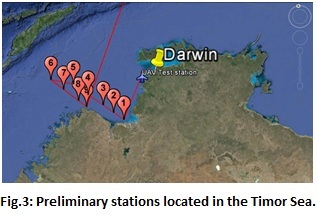 The holistic and multidisciplinary approach of coordinated observations and analysis utilizing a number of state-of-the-art technologies, such as remote-controlled catamaran, unmanned airborne vehicles and trace-metal clean sampling devices (Fig. 1). Application of Next Generation Sequencing will enable us to explore microbial communities at the sea surface to a level never done before. 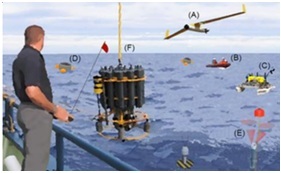 Fig.1: Illustration of sampling events with (A) unmanned airborne systems, (B) small boat operation for manual sampling and deployments, (C) a remote controlled catamaran for surface skimming and near surface processes, (D) free-floating chambers for measurements of gas exchange, (E) sensor packages for near-surface measurements and (F) CTD profiles. The research will be conducted on the R V Falkor(Fig. 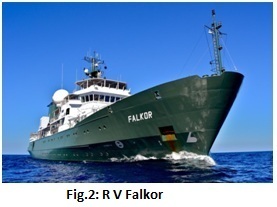 2) operated by the Schmidt Ocean Institute, CA, USA.The R V Falkor is scheduled to embark Darwin on the 10 October 2016. The cruise track includes nine stations in the Joseph Bonaparte Gulf and Timor Sea (Fig. 3)as well three open ocean stations in the Pacific. The cruise ends on 7 Nov 2016 in Guam. Abstract The first IIOE was an important event for German marine sciences. For the first time after World War II Germany was invited to an internationally coordinated event. The participation in IIOE provided a community focus and the impetus to build the R/V Meteor II who undertook its first scientific expedition to the Indian Ocean (IO). Since then German scientists have participated in several other campaigns in the IO (e.g. WOCE, JGOFS, INDOEX etc.). Over the last year the German marine science community is actively discussing how to contribute to an Integrated German IO Study (IGIOS) which would be a contribution to IIOE-2. It is aiming (i) to advance our understanding of the interactions between geological, oceanic, biological and atmospheric processes that give rise to the complex physical and biogeochemical dynamics of the IO region, and (ii) to determine how those dynamics affect climate, monsoons, atmospheric chemistry, biogeochemical cycles, ecosystems and human populations. IGIOS will be structured around four themes: 1) Global change and anthropogenic impacts, 2) Biogeochemical cycles and atmosphere, 3) Ocean circulation and paleoceanography, and 4) Ocean crust. Each of these Themes will include a set of specific questions that need to be addressed in order to improve our understanding of the past, present and future IO system. German marine scientist are very interested to intensify their research profile in the IO over the next decade and are looking forward to contribute scientific ideas as well as observational, modelling and assessment and synthesis capabilities to the emerging IIOE-2 framework.